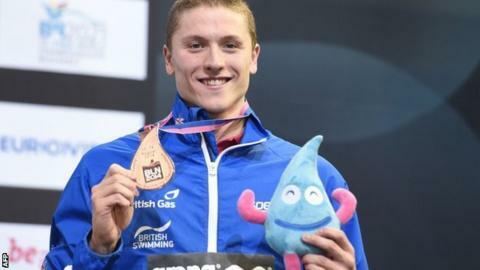 Roberto Pavoni secured Great Britain's 10th medal at the 2014 European Championships, taking bronze in the men's 200m individual medley in Berlin. He was just 0.12 seconds behind the winner, Hungary's Lazslo Cseh, with German Philip Heintz claiming silver. "It's great to get up on the podium as I've seen a lot of GB guys do it already this week," said Pavoni, 23. "Seeing other people I know, train and race with do it made me feel I could do it as well." Pavoni is hopeful of another medal later in the week when he goes in his favoured 400m individual medley. "At first I was disappointed because I saw how close I was to the gold," he said. "And then I saw how close I was to fourth so I've just got to count myself lucky." Although Pavoni's medal was the only one for GB on day three in Germany, there were other notable successes. Stephen Milne and Jay Lelliott finished fourth and fifth respectively in the men's1500m freestyle final, smashing their respective personal bests in the process. Both swam under 15 minutes for the first time, with Milne lopping off 9.5 seconds from his previous best. "Tremendous. I don't know where it came from," said Milne. "I've wanted to swim under 15 minutes for ages and now I've finally done it. "I'm so pleased. I think we both did really well." Elsewhere, Jazz Carlin impressed as she led qualifying for Thursday's women's 800m freestyle final, touching 2.5 seconds quicker than her nearest challenger. Ross Murdoch also qualified fastest from the men's 200m breaststroke semi-finals, while his team-mate Andrew Willis was third. Georgia Davies qualified second for the women's 100m backstroke final, but expressed disappointment with her time of 1:00.18. And Aimee Willmott will look to add to her bronze medal from the 400m IM when she goes in 200m IM final.